Usually nothing that interesting happens at media days. Sometimes players like Kentucky's Dicky Lyons confess to having dreams about other quarterbacks in the league. A subpoena gets tossed here and there. 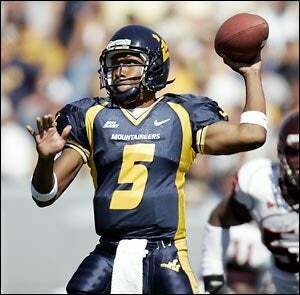 And, you know, occasionally a top Heisman candidate like Pat White says West Virginia's baseball coach is a racist. Uh oh. "In my knowledge of West Virginia baseball, there's not been many players of my race on his team," White said. "He's not too high on it." The he in question was WVU baseball coach Greg Van Zant. The state of West Virginia will now self destruct in... Oh, hell. Never mind. Within a few hours White will clarify his remarks and explain that by "players of my race" White meant "black quarterbacks on the football team." Maybe that line won't work so well either. Anyway, I hesitate to mention it, but once again this quote didn't come from Morgantown/Deadwood.